At daybreak on Saturday, 14th of October, 1066, King Harold of England could be forgiven for feeling that things were going his way. He had been elected and crowned king of England in January, and had just routed an invasion by his brother Tostig and the Norwegian king Hardrada, killing both in the process. Now he was in Sussex facing another challenge, from Duke William of Normandy, but despite the speed of events he had managed to raise another army, and may even have slightly outnumbered his new foe that morning. The battle that followed, to be known as the Battle of Hastings, would see his death and a radical change in his country as the old Anglo-Saxon system was swiftly usurped by the new Norman administration. 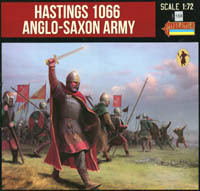 It was perhaps the most decisive battle in English history, and has long been the subject of sets of military figures. Any Anglo-Saxon army of the time, including that which faced William on that fateful day, was made up of household troops (the elite and well-equipped warrior leaders) and the Fyrd, men of lower social status who were called up as required to serve for a period, but were still properly armed. All able-bodied freemen could be called up in an emergency, but they were of doubtful value and very poorly armed. Many sets have portrayed Anglo-Saxon armies around the time of Hastings, but from the look of these men the present set concentrates on the Fyrd, men ready for battle but who spent most of their lives in the agricultural normality of everyday life. We say this because none here have much armour, nor the elite weapons such as swords. These men generally wear the normal tunic (though some are a bit short here) with trousers and perhaps cloth strips wound round the lower leg. A few have the advantage of quilted garments, which would have had some value as protection, and half of the poses have acquired helmets typical of the day (apart from the second man in the last row, who wears something like the 8th century Coppergate helmet), though the rest have cloth or leather caps, or are bareheaded. As figures depicting the Fyrd, which were the majority of the Saxon Army, these work fairly well. The most common weapon of the ordinary Fyrd was the spear, and four of these poses carry one (middle row). Though it has been accurately represented, we were not keen on any of these poses. The two holding it over their head hold it directly over the middle of it, which is obviously unnatural as you only need to reproduce this pose yourself to realise. It makes for an easy job when producing the mould, but the man is flat and awkward to look at. The third man is a familiar pose, yet would seem fairly unlikely as he would need a lot of room to the side to allow him to raise his spear like this, and is again flat and hardly suitable for the tightly packed ranks of the Anglo-Saxon Army at Hastings, yet alone the cramped conditions of a shield wall. Another favourite weapon was the axe, and three of these poses (top row) handle this weapon. These poses are little better than the spearmen, being once more flat and ungainly. The man with the long-handled axe holds it such that he would get little swing or force to the blow, and the last figure in the row has the axe directly below his shield, so cannot be in the middle of a swing, so why is the axe being held there? The first axeman is just rather flat, so not impressed by these poses either. You might think that three of these men are using the sword, but in fact they all carry the scramaseax, a very common knife carried by most Saxon men, and a weapon which could be long enough to be used almost as a sword, as these examples are. We liked the figure in the bottom row holding is over his shield, but the man holding it over his head has his right arm in an anatomically impossible position, and why would you hold this weapon over the back of your head? The scramaseax itself is fashioned 'broken-back', with a sharp angled back to the blade towards the point, so it is nice to see this weapon modelled here. However we were unable to ascertain to what extent this weapon was still in use by 1066. There are two men armed with javelins, which were also present in numbers at Hastings. Both these poses are actually pretty good to our eye, with one man having just released a javelin while clutching two more with his shield hand, and the other seeming to be down to his last but ready to use it. Like many of the poses here they both hold a (fairly small) round shield by a central handle, with a protruding boss on the face to protect the hand, which is entirely typical of such men, though we were pleased to see one man had acquired the more up-to-date kite shield most of his betters would have carried. Finally we have two archers. Archers do not seem to have been very numerous at Hastings, so just a couple of poses makes sense. One man draws his bow, though the arrow itself, largely missing its shaft, is desperately short, so he cannot even begin to draw the bow properly. The other archer is reaching for a new arrow, and we thought this by far the better pose of the two. Although none of the poses are bad as ideas, the execution often leaves plenty to be desired. The sculpting too is fairly rough, with exaggerated smaller details and some elements – even faces – that are hard to make out even when we know what they are supposed to be. At the time this set was released Strelets were making great improvements in their sculpting, but this set is very much of the old school, with all the problems that come with it. These are not great figures to look at, and many are much too flat. Luckily there is no assembly here – all weapons and shields come as part of the main figure, and there is virtually no flash at all, so the production values for the mould are good. These are fairly typical Strelets figures, with fairly good accuracy but an unpleasing style of sculpting and some poorly-done poses. However they are just the figures that are unique to this large set, which contains much more than the four sprues of these figures. Also in the box are three sprues from the Strelets set M003 Anglo-Saxons, three from M050 Anglo-Saxons Before Battle and two sprues of the Saxons from their other big battle set 911 Stamford Bridge, though with several poses removed. See those reviews for our comments on those figures, which are mostly a fair match for these new poses, though we think many, including Strelets themselves, have done better than this in the past.